The SASI Blog has been bustling lately with lots of darling projects from the Baker's Dozen. We plan to have at least 3 posts a week and sometimes more to share with you. Be sure to subscribe (see the sidebar) so you don't miss a thing! It's time for Our Friday Friend and I couldn't be happier to introduce you to Lynn Mercurio. I bet most of you are familiar with Lynn since she is on the Cupcake Crew (Taylor's Friday Sketch Samplers) plus she's the Monday challenge hostess over on SCS with the Technique Lover's Challenge. Lynn has such a fun style and we just couldn't resist the cupcake tree she created for last week's TECC. --How did you become addicted to paper crafts? How long have you been stamping? A co-worker introduced me to creative stamping in 2004 and from that time I've been totally addicted. I haven't stopped learning, creating and BUYING! I would call my style "chameleon" because my style changes depending on the occasion and the stamp set I'm using. I go from elegant to whimsical. My very favorite project to create is one where I have a specific purpose and person in mind. Having focus really helps me in the creative process. My favorite sweet treat is a combination of two snack foods; popcorn and peanut M & Ms. Mix them together and you have the best combination of sweet and salty. This is an especially excellent snack while at the movies, but I have been known to mix up a batch for home movie night! 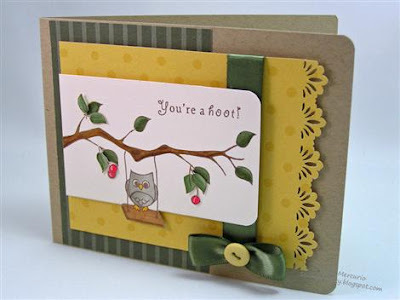 You'll want to visit Lynn at her blog Stamperosity as well as take a peek at her SCS gallery. Lots to see! Thanks Lynn for being Our Friday Friend! Beautiful colors and I love that decorative edge on the yellow panel. Pretty card Lynn! Love the great color combo, the border punch, the pretty ribbon... TFS! So cute Lynn! Love your border and the little cherries you added! love your card & getting to know you better! we have similar 'styles' when it comes to stamping-I love having a recipient in mind too and my style changes to suit the stamps/occasion! love popcorn too! Love this card! The colors and image are wonderful!